The Bolt II is power-packed and always keeps cool, squeezed into a small form factor gaming PC. But two major caveats: price and limited upgrade options. If I had to choose one word to describe the Digital Storm Bolt II, I'd pick "deceptive." I mean that, of course, in the most endearing way possible. While it doesn't look like it can play some of this year's games at max settings – and sure doesn't sound like it either – I promise you, this gaming PC is an absolute monster. And don't let its size fool you. 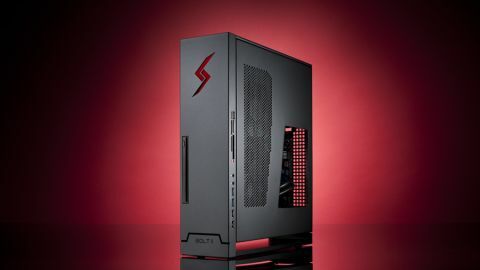 The Bolt II packs a liquid-cooled Intel Core i7 CPU and Nvidia GeForce GTX 780Ti that collaborate to produce a textbook high-end gaming experience. This would-be Steam Machine is intended to sit beneath the TV, but why pigeonhole into to the living room? This gaming PC easily rivals some of the best full-size boutique machines around. The Bolt II could make for a commanding gaming rig in your bedroom or study and, if you're the social type, will garner respect from your rivals at a local LAN. But as a trade-off, the Bolt II will cost you a cool $2,550 (about £1,580, AU$2,786) as it was configured for this review. This also won't necessarily be the easiest box to upgrade down the road. The phrase "good things come in small packages" is given a new definition here. The Bolt II is unrealistically slim, measuring in at 16.4 x 4.4 x 14.1 inches (H x W x D). For a visual comparison, that's about 2.5x the size of the PS4 and 1.5x bigger than the Xbox One. While its size is uncommon, it's the aesthetic appeal of the custom chassis that's the real showstopper. Available in either solid black or burnished gold paint, every available panel – save for the windowed plastic panel on its right – is perforated with holes for maximum airflow. Small rubber feet adorn the underside when the Bolt II is standing up, or on its left side on the chance you'd like it to lay flat. The left set is removeable, if you decide that your Bolt II belongs in an entertainment center. Open up the case by twisting two thumbscrews on its rear panel, and you'll find a masterwork of cable management and Tetris-like component placement. First and foremost is the 240mm custom liquid cooling system that takes up most of the front half of the case. Cooling lines run from the system itself to the GPU, stopping off at the CPU before heading back to the start of the loop. This system takes up almost all of the rig's interior. That sounds problematic, but after four hours of processor heavy VR gaming on the Oculus Rift, temperatures barely reached the 95-degree mark. How can I be so sure? The Digital Storm Hydrolux Control Center, a program exclusive to Digital Storm's liquid-cooled systems, told me so. The only disadvantage to the system, which I mentioned in my Digital Storm Vanquish II review, is that the company doesn't offer much room to change out components. If you remember, the Vanquish II sported a Asus H81M micro-ATX motherboard. The Bolt II trades out the larger H81M for a "9 Series" Z97I-Plus mini-ITX board. The mini-ITX form factor facilitates such a tiny case, but it's not without drawbacks. A miniscule board keeps the Bolt II from fitting more than one of each component: one GPU, one SSD, one optical drive, one mechanical hard drive, and two sticks of DDR3 memory. Upgrading here means swapping one out for another, never adding to what's already there.